As a long time user of mouse and keyboard, a “touch only” interface makes me feel like I’m working with 7 fingers tied behind my back. Hmm . . . . I guess I only say that because it sounds funny. I’m not a touch typist. Ten fingers never come into play. I’m only working four “hunt and peck” fingers now, as I write this blog. Given typing prowess like mine, an onscreen keyboard is not much of a hindrance. What can cost me efficiency, however, is the method of selection, i.e., Touch. I’ve owned a Surface RT for about three months and find the devise quite useful. “Metro” and I have come to terms, and I acknowledge the touch friendliness. Be that as it may, my more critical tasks happen on the Desktop, where “touch only” hamstrings the effort. 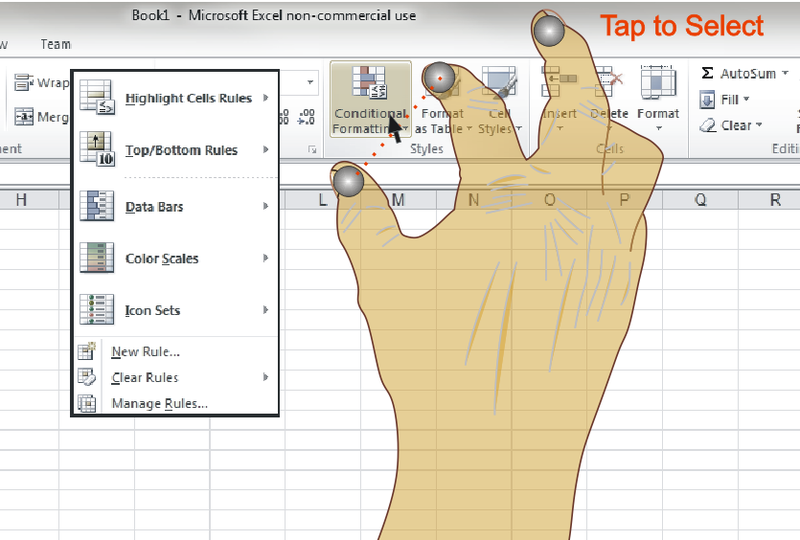 We have been led to believe that the next MS Office release will be more touch centric. Good news for everyone with modern screen, especially those of us using RT. I suspect, though, that future “legacy” app releases will incorporate “touch” at varying rates, the time frame for some major applications extending beyond the lifespan of these early Windows Pro devises. A main advantage for tablets – no peripherals needed – encounters a huge obstacle with imprecise pointing. Adoption of these devises will be impeded. This is my suggestion, and where those three, unfettered fingers come into play. A standard two finger touch gesture is taken – Pan and “Pinch to Zoom” are too useful. A time sensitive three point touch, though, should be available. If thumb and forefinger are stationary for 250 milliseconds, and the middle finger taps the screen, a cursor should appear at midpoint of thumb and fore-. 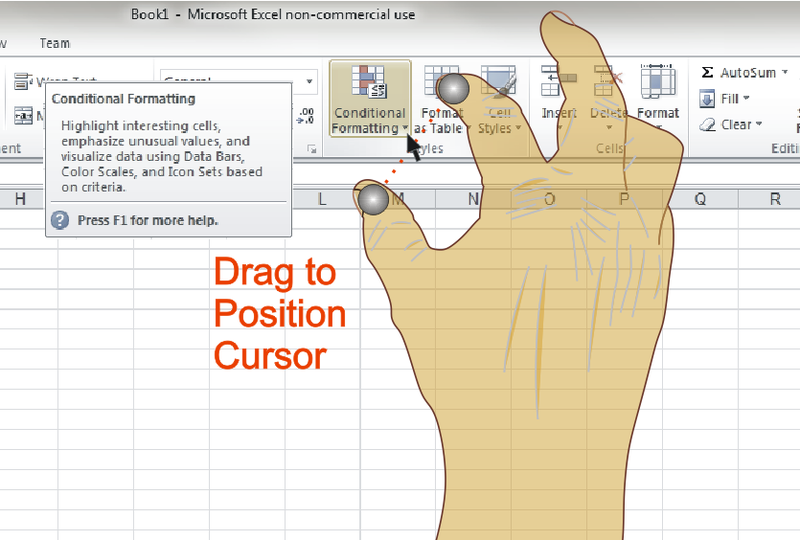 Those two fingers can be moved, rotated, and/or spread apart while maintaining the cursor exactly at the middle. This cursor now inherits all the “hover” capabilities of a standard Windows cursor, and the user has an unobstructed view. Subsequent middle finger taps make selections. A middle “tap and hold” reveals a “Right-Click” menu. Removing all fingers returns the OS to a standard touch mode. I included some graphics to illustrate the sequence. The first set shows an interaction with AutoCAD, the later images show similar use with Excel. Hover is critical in CAD applications – to facilitate Object Snap features. The image below shows a user with a cursor already acquired (in AutoCAD a point selection process turns the cursor into crosshairs) . The start point for the Line uses a running osnap to select an existing endpoint. Mid way through the command the Cad operator uses the “Right-Click” feature to call the OSNAP Short-Cut menu. 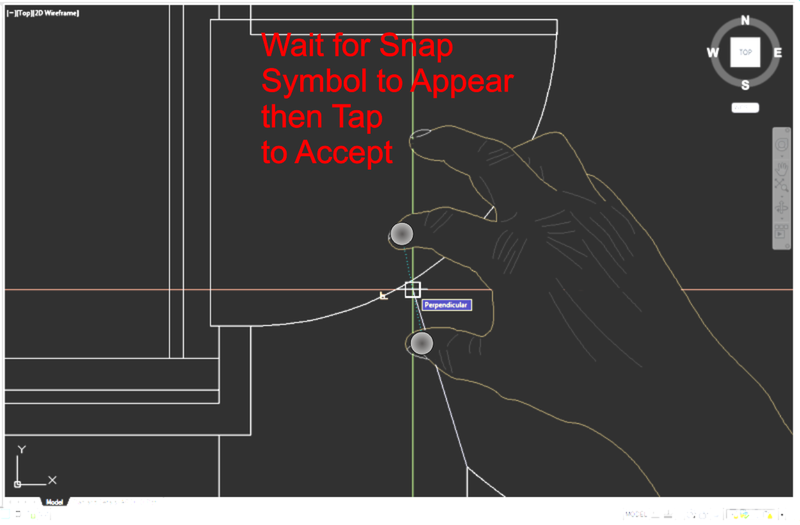 The point acquisition process would be suspended, but the three finger gesture continues with arrow cursor to make a temporary snap selection (Perpendicular, for instance). 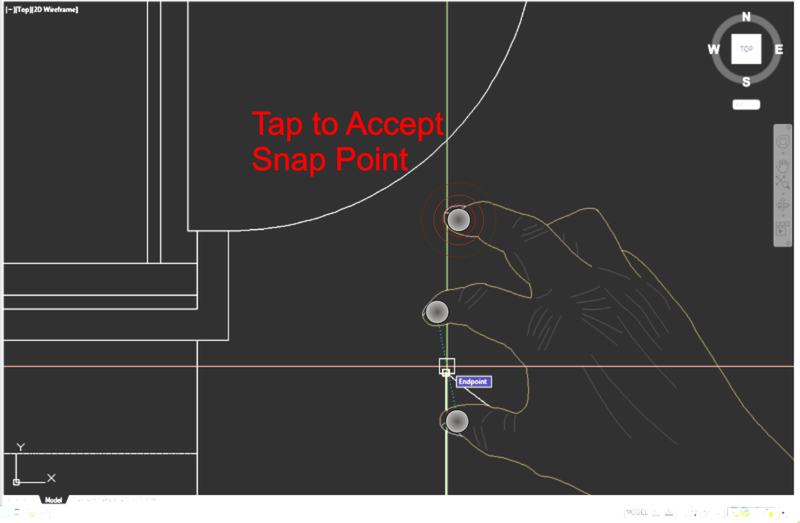 Now the Cad operator moves the aperture close to the arc, allowing AutoCAD’s to find the appropriate snap point, often well removed from the cursor. The command can be terminated here by removing all fingers, or, if line creation continues, point selection proceeds with the appropriate “rubber banding”. The speed of multi point selection should approach that of mouse driven AutoCAD. And, given that most tablets have at least 5 point touch capabilities, zoom/pan operations could be realized with two fingers of the opposite hand. 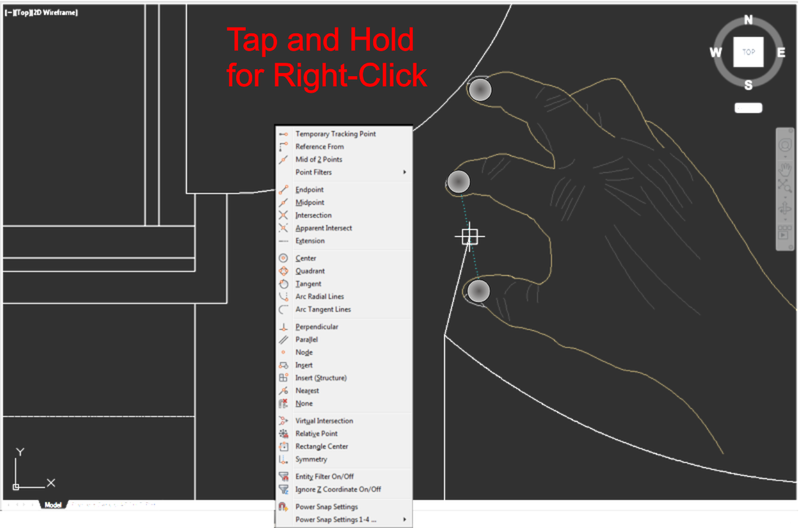 Excel doesn’t suffer to the same extent as AutoCAD, but touch does require more “sub-menu”ing to isolate the correct selection. The standard windows cursor is more precise, thus eliminating the ambiguity inherent with a selection area the size of a finger tip. Here, the cursor has been acquired and moved over a UI element. The “On Hover” event shows the tool tip which the OS locates opposite the hand location. A middle finger tap calls the next menu. Repeat the process to create a sub-menu selection.